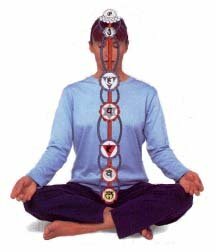 By alternating the flow of your breathing you can ensure your energy is flowing evenly through the major Ida & Pingala nadis which connect to the chakras. When the left side (ida) dominates you are drawn toward mental activities and feel introverted. It is said to be cool as "moon breath" and its energy cools your body, lowers metabolism & inhibits body activity. The right side (pingala) is inclined towards extroversion, physical activities & work. It's said to be hot and called "sun breath" and generates heat, raises metabolism & accelerate body activities. In the course of a day your breathing will alternate between the right & left nostril. If you're in good health this alternation takes place regularly every 110 minutes. Just before the nostrils switch breath flows through both nostrils equally for a few minutes. If breath flows through one nostril more than two hours, the body is unbalanced - too much heat or cold.